Not one part of the plan went as anticipated. It didn’t even go to alternate plan B or C. It was a miracle that the trip even made it off the ground and that the passengers didn’t get stranded in the jungle and have to be rescued by the military. San Cristobal de las Casas is a small mountain valley surrounded by hills on all sides, in which live an indigenous population of Mayan people who are known by the names of Tzotzil and Tzeltals. At a location of seven thousand feet, clouds cling to the mountaintops in the early morning hours and temperatures hover in the low sixties. Every day but Sunday, there was a large Indian market where the locals go to buy provisions for their daily needs, mainly fruits and vegetables, while to the north of the main market was a large building that primarily housed traditional butcher stalls. If you didn’t have a strong stomach, it’s not a place you want to visit. Canned goods and regular household items were sold in small mom and pop stores, where the selection was not terribly great. In the entire city, there was no supermarket or large-scale grocery store. My Spanish-speaking helpers and I ventured into this labyrinth of markets and small stores to make our food purchases for a group of fourteen for seven days in the wilderness. On my scouting trip to Mexico in 1974, I had observed the native women making tortilla shells with small balls of dough flattened with a metal tortilla press. It looked simple enough and I felt confident it was something I could do, so I planned a number of meals around tortillas filled with meat, cheese, tomatoes, etc., like a tortilla one would order from Taco Bell or Taco Time. The meat that we purchased was fresh, really fresh, and we had to get it on ice immediately. Fruits, vegetables, and flour products were purchased from the open-air market, or small mom and pop stores. With the food purchases complete, we loaded the items into the back of the pickup, took them to the campground where we were staying and repacked the items into the food boxes and ice chests, then we headed for the airport. The Islander was a light utility aircraft that could carry a crew of two and nine passengers, or cargo weight of approximately three thousand pounds. I had no idea how much our equipment weighed, but although a tight fit, we got it all into the aircraft. The plan was for all three of us to fly to the landing strip adjacent to the river and unload everything onto the ground. The two guides would then move the equipment to the water’s edge, while I flew with the pilot back to San Cristobal. The tricky part about moving the equipment to the river from the airstrip, was that the path to the river went right through property of villagers who lived beside the river. I could only hope that the guides would use diplomacy in moving the equipment to the river, and not trample someone’s garden. After the plane was loaded, the guide with the offensive body odor declared that the plane was overloaded and not safe, and he was not going to fly in it. It was a standoff; I had to appeal to the pilot to assure the malcontent that the cargo weight was within tolerance. It was for certain that I couldn’t afford to hire the pilot and plane twice to make the round-trip to the jungle airstrip next to the river. To my knowledge, I was only the third river outfitter to make this journey on the Usumacinta River. From others who had made the journey a few years previously, I learned that the cargo plane they used had been a DC-6, but it had crashed in the jungle and was no longer available. I was sitting in the passenger seat next to the pilot on the journey over the Lacandon Jungle to the airstrip at Tres Nacion (translated: Three Nations) while the two guides sat in the back with the boating equipment. As we lifted off the runway and gained altitude, ahead of me in the jungle lay the remains of several wrecked airplanes, including the skeletal remains of two DC-6s that apparently had crashed after takeoff. The Lacandon Jungle over which we were flying was a vast area of green, forbidding wilderness, inhabited only by a few indigenous people known as Lacandon Indians. Lacandons, both men and women, have long, shoulder-length black hair that always looks like it needs to be combed, and wear white tunics that extend below their knees. They’re often seen around the ruins of Palenque selling their homemade crafts to tourists. Their most notable craft item is a set of bow and arrows that they hock. 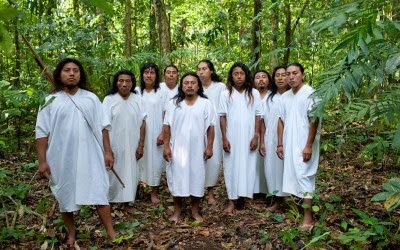 Lacandon Indians who live near the ruins of Palenque.